Acquisition History: Union Meadows WMA was purchased by Fish and Game in 2013 in partnership with the Society for the Protection of New Hampshire's Forests using New Hampshire Land and Community Heritage Investment Program (LCHIP) and USFWS Wildlife Restoration Program funds. Description: Union Meadows WMA is located on Marsh Road along the Branch River and Union Meadows in the Town of Wakefield. The parcel has more than 0.8 miles of frontage on the Branch River and more than 0.75 miles of frontage on Union Meadows, a wetland containing over 230 acres of diverse wetland habitat. 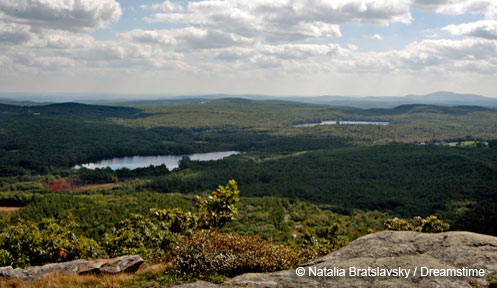 The land is identified as some of the highest quality habitat in the state in the NH Wildlife Action Plan. Its statewide ranking, the extensive areas of waterfowl habitat found along both the river and the large wetland, and the adjacent upland habitat made this a high priority for protection. Conservation of the property has eliminated the threats of conversion to residential use along the frontage on Marsh Road and mining for extensive sand and gravel resources which, if removed, would have had a major impact on the lands along the river. Common Wildlife: The extensive riparian and wetland habitats on the property support mink, otter, muskrats and waterfowl including wood ducks, mallards and black ducks. The uplands support an equally diverse mix of species including bear, white-tailed deer, turkey, ruffed grouse, woodcock, and snowshoe hare and several species of songbirds. Directions: From the junction of Routes 16 and 153 in Wakefield, continue on Route 153 north about 1.5 miles to Whippoorwill Road on the right. Take a right onto Marsh Road, about 2/10ths of a mile down. Park by the orange gate just after the Branch River bridge.